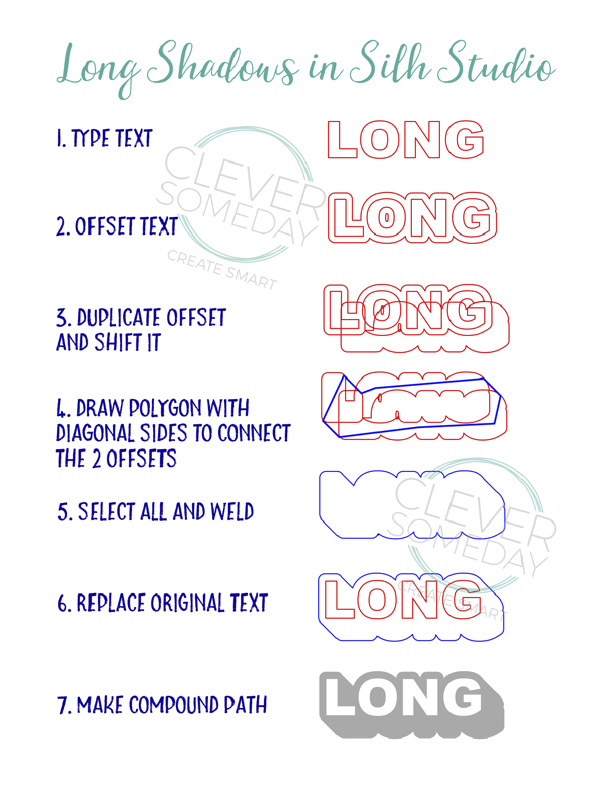 A question came up in one the Silhouette Facebook groups about how to create a long shadow so I put together this mini-tutorial graphic. As you can see, it isn’t automatic, but not too difficult, especially when using an offset like this. I am posting it here in case it might be useful to some of you. you can also make a ‘long’ shadow by using the shear tool. i sheared my word just a bit, then did an external offset to .125 and sheared ‘just the offset’ to where i wanted the shadow. Thanks for the reminder, Kat. For those that have DE, the shear tool is a great technique for creating cast shadows, which are a little different from this. Love the tutorial. Brilliant! Thanks so much. Wow! Excellent tutorial! I will save this info for a time when I want to create this look. Thanks so much for sharing it with us!! I have a question. I saved an article the other day and now cannot find it. I have several files in silhouette I made and used but now when I try to open it pops up a block that says this file is not compatable. What can I do. This is a bug. Contact support for instructions on how to fix it. I had no clue!! I have to say thank you, I have learned so much from watching your tutorials and happy to have found your blog!! !